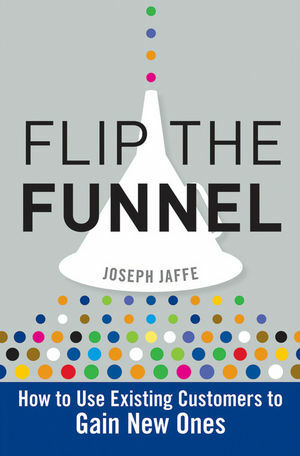 At the San Francisco Marketing Book Club meeting last week we discussed “Flip the Funnel: How to use existing customers to gain new ones“, by Joseph Jaffe. What’s the verdict? Buy the book. OK, now the explanations and caveats. First, the book talks about the essential function of customer service and how to leverage it with today’s current technologies, including (of course) social media. If you haven’t read much about customer service or if marketing isn’t your background, then the book will be a good starting point. For those that have some experience and background on the topic of excellence in customer service and have read one of the many classic books out there, then a lot of it will be just a review of what has already been said. My biggest disappointed was that the author used mostly well known examples to illustrate his points. JetBlue, Domino’s, United Airlines, Zappos, and others are cases that we marketers already know. I would have liked to see other companies that he has worked with and are not so obvious and how they implemented his recommendations or how they have failed to recognize the importance of “flipping the funnel”. But then, maybe I’m not the target market for this book. The other thing to be aware is that Mr. Jaffe is a bit verbose. If you have listened to his podcasts or seen his videos, then you know what I’m talking about. I felt like skipping a few pages just so I could get right to the point. Others may be ok with his style, but it just made it much harder for me to make progress. You should read an excerpt or check it out at the local bookstore to see if you like how he writes before buying the book. How right he is! Why is it we spend all that money and effort into getting people interested just to forget about them once we get the purchase order? There’s gold to be mined in existing customers and the book treats this as the new mantra for marketing. In Jaffe’s words “Keeping, cultivating, and nurturing existing customers and establishing unbreakable bonds with them”. Although the methodology varies based on your industry and whether you are a B2B or B2C company, the big picture is clear. “The more opportunities we give our customers to engage us (as opposed to us engaging them), the more likely they’ll be able to do just that”, and I completely agree. According to Jaffe, we should segment customers into “walkers”, “talkers”, and “hybrid”, and deploy distinct approaches for each one. His new “flipped funnel” approach to doing that is called A.D.I.A (Acknowledgement, Dialogue, Incentivization, and Activation). The whole point of the “new” flipped funnel approach is to create this unique “customer experience”, which means giving customers ways in which they can interact with the brand, and we can interact back with them. Sure, this is not new, but he suggests that “companies need to have an intensive, omnipresent approach to dealing with their customers”. Does this sound like your company? I know, everyone talks about how important the customer is, etc but very few companies really put the necessary resources behind that. The payback, he argues, is that “customers will pay a premium for higher perceived value”, and such value is likely to be how customers are treated. Customer service becomes your product, or better yet, the differentiator between your product and your competitor’s. Where I think the book falls short is on the implementation side. It talks about companies having to deploy capabilities across every single customer touchpoint, connecting the dots between the physical and virtual world and giving customer service the strategic value it deserves, but there’s not much in terms of HOW companies are doing that. Although, if the research from MS&L mentioned in the book is correct (one third of companies are not incorporating social media in marketing efforts, and of 63% that were, a full two-thirds had not made changes to products or marketing based on customer feedback), then the problem is actually there aren’t many good examples to follow. Are we entering a new world, travelling a path very few have survived? We’ll see. In sum, if you’ve already read a few books on the subject, you’re not going to gain anything new but for the novice or uninitiated this book may be just what you need to get your company on the right track to flipping the funnel and gaining new customers. You are currently browsing the The Effective Marketer blog archives for October, 2010.